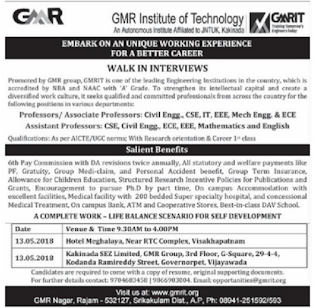 GMR Institute of Technology, Srikakulam has advertised in THE EENADU newspaper for recruitment of Professor/Associate/Assistant Professor jobs vacancies. Interested and eligible job aspirants are requested to attend interview on 13th May 2018.Check out further more details below. With research orientation &Career 1st class. Job Location: Srikakulam, Andhra Pradesh. 6th Pay Commission with DA,revisions twice annually. Interview Venue 1: Interview on May 13h ,2018,Sunday, 9.30a.m to 4p.m. Hotel Meghalaya, Near RTC Complex, Vishakapatnam. 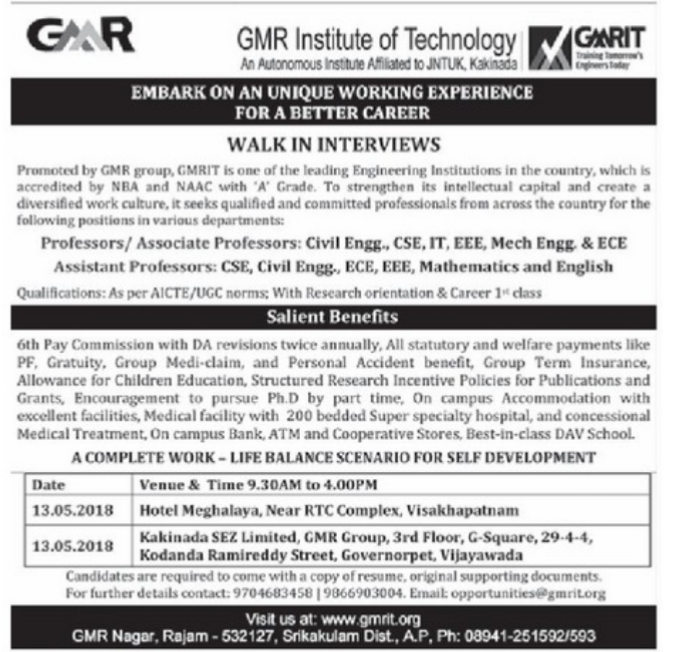 Interview Venue 2: Kakinada SEZ limited, GMR group,3rd floor, G-square,kondanda Ramirreddy Street,Governorpet ,Vijayawada. Candidates are required to come with resume and original supporting documents.